There’s a special feel to Mombasa, Kenya’s second city at the coast. It’s a mixture of the tropical Indian Ocean beaches, the humid and salty heat and the dominant presence of the famous Swahili culture: the vibrant mix of African, Arab, European and Asian peoples that have mingled here for many ages of invasions and trade. For many, Mombasa is just the hub to the beach resorts. And though the beaches are everything you expect – soft white sand, ever shining sun and palm trees – that view is selling the region short. As the oldest city of East Africa and the epicenter of Swahili culture, it has interesting historical sights, a lot of culture and vibrant city life to offer. Moreover, the coast offers some excellent sailing, diving and marine parks, and it’s a good starting point for visiting some top safari and nature parks as well. This page is my main entry on the city - all my pages about Mombasa are linked from here. Beach resorts: Along the excellent tropical beaches north and south of the city, you’ll find dozens of good beach hotels in all price categories, offering luxury and many activities. More on them below. Water sports: The Kenyan coast offers diving that are rated as world-class, even by professionals. Wind surfing has been done in the area since the 1970s, kite surfing is a new hit and you can also hire a traditional dhow (Swahili sailing vessel) with crew for shorter or longer trips. Here’s more about things to do at the beaches of Kenya. Safaris: The city is a good base for visiting some of the well-known safari and wildlife parks (especially both Tsavo parks but also Amboseli), and lesser known nature and marine parks are even in the direct vicinity of the city. See my safari in Mombasa page for the details. 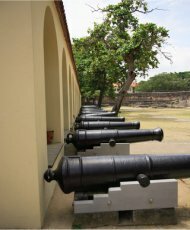 Cultural and historical sights: Within the city, Fort Jesus (a military fort built by the Portugese in 1593) and the Old Town vividly show the rich history of the region. Outside the city, the Gedi Ruins show that the coast region was doing very well commercially and culturally ages ago. Here’s more about tourist destinations in the region. Festivals and Events: Mombasa hosts a variety of festivals and events such as the Mombasa Carnival that happens every November or Mombasa Triathlon in September. Most of this festivals offer lots of fun, and offer some insights into the Swahili culture. Shopping: Mombasa’s shopping scene blends markets with artisanal co-ops and food with fashion. There are also lots of souvenir shops, but prices tend to be high. At the coast, hotels are luckily cheaper than in Nairobi. Basically, at the coast you’ll get a top-end hotel for the price of a midrange hotel in Nairobi. Within the city, my choice would be the Royal Class Hotel – it’s good value for money, it’s located in the heart of the city centre and it has a great rooftop restaurant. However, unless I really needed to be in the city, I rather stay in one of the beach hotels north or south of the city. They are almost always right at the beach, come in all price categories and many have far better facilities (including a large terrain with gardens) than the city hotels. I’ve reviewed the best Kenya beach hotels here. By the way, before picking a hotel, it's good to first decide which beach you want to stay on. Some are busy with lots of facilities (i.e. 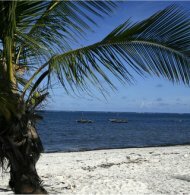 Diani Beach), while others are heavenly quiet but may have much less facilities (i.e. Tiwi Beach). It depends on what you like. Please see my Kenya beach reviews and I’ve also listed my favorite beach hotels by beach. If you’re flying in from outside Africa, you’ll usually have to fly to Nairobi and change planes for Mombasa there. However, there are also (typically from Europe) some charter companies who fly directly to Mombasa as part of a holiday package. They are often cheaper, so it pays of to look for them. Please note there are no direct flights from North America or Australia to Kenya. Here are all the details about available flights to Mombasa. The Kenyan travel sector is well developed, meaning more possibilities for discount flights - here are my tips to get cheap flights to Mombasa. If you’re flying in from a neighbouring country, you have several Kenya airports (or rather air strips) to choose from as your landing point. The easiest ways to get around are by taxi and matatu. Taxis are plenty available. Short rides should cost you around Ksh 300 and longer ones around Ksh 1000. Taxi drivers will also be happy to be your private driver for a day. If you don’t make hundreds of miles – gas is expensive – it should cost some 3000 to 4000 Ksh per day. But taxis aren’t always in a decent state and the traffic can be pretty mad. Matatus are private minibuses that run on fixed lines. They are easily recognized by the fierce graffiti (and loud benga or rap music)… For just 30 Ksh you can go with one as far as you like. At any point, you can get in by raising your hand and get out by tapping the driver’s shoulder. This is transport the African way: cheap and efficient. However, stick to taxis after dark, since there have been cases of matatu robberies at night. In some cases car hire in Mombasa may also be the right choice, but make sure you read all the small print. The sun in Kenya is always shining and temperature differences from month to month are small. However, you have to reckon with the two rainy seasons each year: April to June and October-November. The tourist seasons are December-January and July-August, which coincides with the dry seasons. During rainy seasons, some national parks are badly accessible or even closed. On the other hand, prices of accommodation etc. are lower during the rainy seasons and if you want to avoid crowds, this is the time to go. Regarding temperature: December to April are the hottest months with an average maximum of 31C during the day, while the coolest months of July-August are only a few degrees lower. The coast area is hotter than Nairobi and more humid, making the weather feel like a hot wet blanket sometimes. Here’s more about weather at the Kenyan coast. There’s a big practical travel information section at this site where you can find all the details about visa, money, health etc. How Are The Flight Connections?